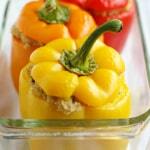 Home » Main Dishes » Cheesy Quinoa Stuffed Peppers. Looking for a filling dinner that’s healthy and vegan? 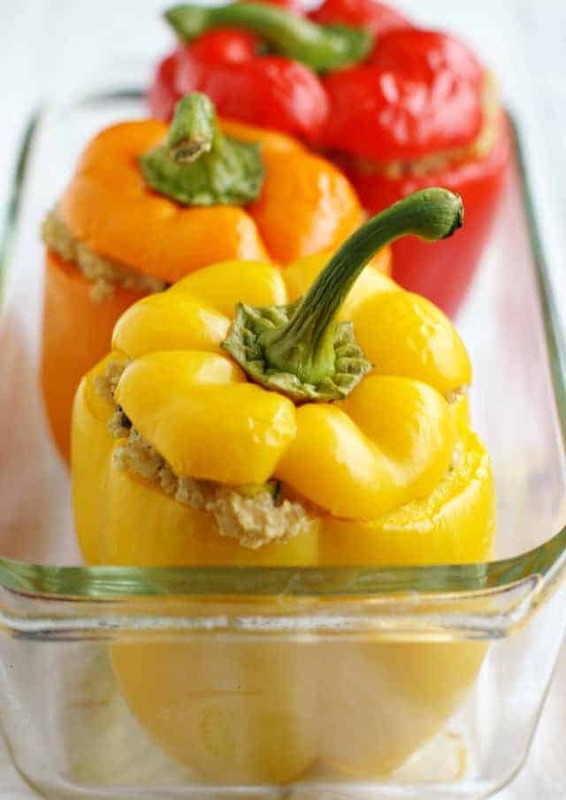 Try these cheesy quinoa stuffed peppers! It’s an easy dish that’s sure to be a family favorite. It can be tough to find a hearty dinner recipe that’s both free of meat and dairy products. Many vegetarian dishes are very filling, but contain a lot of cheese or other dairy. These cheesy quinoa stuffed peppers are really hearty and filling, plus, they are so super simple to make. You can customize this recipe to suit your needs…use the milk of your choice, use rice instead of quinoa if you prefer, add a few more vegetables, use whatever cheese you like. I like to bake the peppers for a little while without the filling, and then again once they are stuffed full of quinoa. I find that the pre-bake helps them soften up a bit more. No one likes mushy peppers! What kind of peppers should you use for stuffed peppers? I like to use red, orange, and yellow bell peppers to make stuffed peppers, but you can also use green bell peppers. Does non-dairy cheese taste good? There are many different varieties of non-dairy cheese. You will need to research and find a brand that works for your specific dietary needs. I love the Daiya jalapeno Havarti block of non-dairy cheese. It has a ton of flavor and gets really creamy when melted, and I would say it is very cheese-like. It’s the perfect cheese for these quinoa stuffed peppers. How do you make quinoa stuffed peppers? Remove the tops and seeds from bell peppers. Place them in the oven to bake for a little while. Make the filling – cook the quinoa, then add the black beans, zucchini, and other ingredients. Place the filling inside each of the pre-baked peppers. 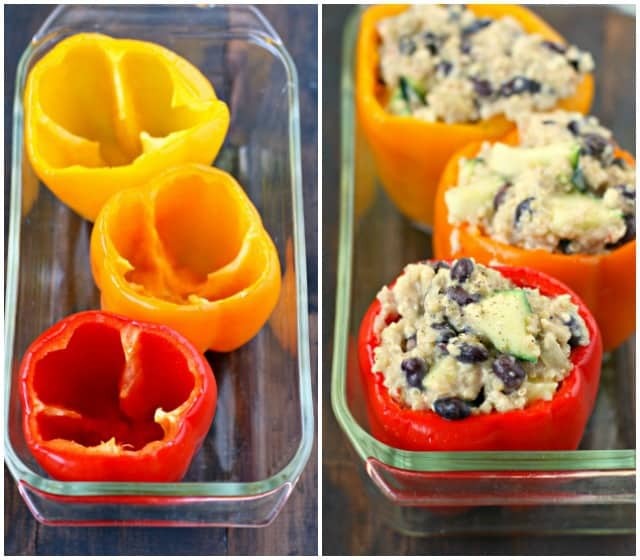 These cheesy quinoa stuffed peppers are a quick and healthy dinner that's full of flavor! Preheat oven to 350 degrees. Drizzle a little olive oil in the bottom of a glass baking dish. Prepare the peppers: Carefully slice off the tops and remove the seeds and trim the core off the tops if you want to serve them with the tops on. If the bottoms of the peppers are too bumpy, you may need to trim them down so they sit flat in the baking dish. Drizzle a little olive oil in each pepper and bake for about 20 minutes while you prepare the filling. Place the quinoa, the diced onion, and 2 cups water in a large pot with a lid. Bring to a boil, then reduce heat to low, cover, and cook on low for 15-20 minutes until quinoa is soft and fluffy. Add the zucchini, spices, and non-dairy milk and cook on low heat for a few minutes until the zucchini is tender but still bright green. Add the Daiya cheese and stir until melted. Remove peppers from oven and spoon filling into each pepper. Place tops on each pepper if desired. Bake stuffed peppers at 350 degrees for 15 minutes. Let cool for a few minutes before serving. Add more salt and pepper if desired. Depending on the size of your bell peppers, you may have some filling left over. You can either make extra peppers, or just enjoy the filing on its own. Store leftovers in the refrigerator - they should keep for 4 days. That’s all there is to it! And here’s a little secret…if you don’t want to make quinoa stuffed peppers, the filling is really good on its own, too! Sometimes a bowl of creamy, cheesy quinoa is just the thing at the end of a long day. What are your favorite easy meals for busy nights? If you like quinoa, you may want to try this healthy white bean quinoa chili and these chocolate quinoa crunch bars. This post was originally published in November 2014. It has been updated with new tips. « Light and Fluffy Gluten Free Pumpkin Muffins. 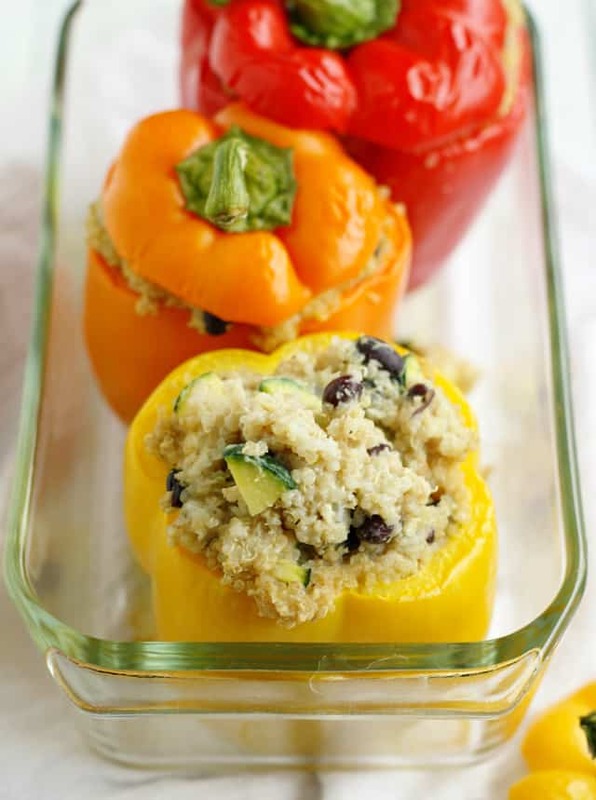 I love stuffed peppers and I enjoy making them with quinoa, too! I like how you get more protein in your meal that way. I hope your holiday season goes smoothly! This is such a busy time of year, I can’t imagine it being my busiest work time, too! I totally love stuffed peppers! Now you’ve got me curious to try them stuffed with quinoa next time instead of the usual rice! Try it, I really like the texture! Good idea with the coconut milk :) I wish we had Daiya cheese in Australia…our vegan cheese options are limited here! Ooh, sorry about that! Maybe Daiya will be available there some day! You’ve inspired me to give quinoa another chance- especially seeing as you paired it with cheese! Pinning! This is a great weeknight meal. Love the colors of those stuffed peppers! This is totally my kind of meal! I’ve had the Daiya shreds before but never tried the block.. need to get on it! Love the color of all the peppers! I didn’t realize you and your huberooski were musicians! I want to see you in concert! Did you know I played the Oboe for like 6 years? There’s nothing like playing music…it really is very therapeutic! Sign me up for all colors of the rainbow peppers! I didn’t know you were an oboist! How fun! Loved stuffed peppers! Kelly these look amazing! I haven’t made stuffed peppers since I’ve been gluten-free and vegan! This recipe totally reminds me of the ones I used to make!